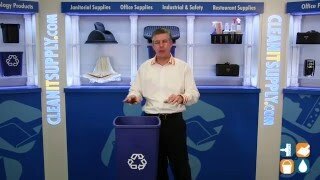 A sure way to make a positive environmental impact and encourage recycling indoors and out is with our Rubbermaid Untouchable Series 23 Gallon hands-free waste disposal container. 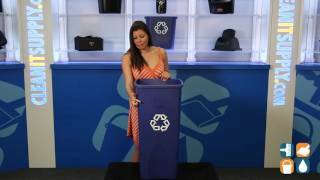 This sleek, square, crack-resistant plastic recycling container is the perfect addition to any surrounding where recycling is emphasized. The can liner has a cinch that allows for retention of the bag and eliminates the tedious job of knot-tying. 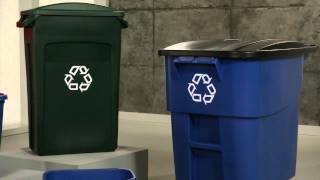 Traditional blue color container complete with the recycle symbol imprint in white, exceed EPA guidelines for post-consumer recycled content and assist in obtaining LEED credits. Tops sold separately (RCP2691BLU, RCP2690BLU). 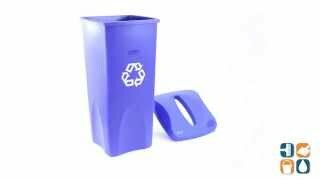 Dimensions for this square recycling container are: 16-1/2"L x 15-1/2"W x 30.9" H, 23-Gallon capacity. Shipping weight: 8 lbs.